Fairyella Ice Pops are tasty, vegan, frozen treats carefully crafted by hand from fresh fruits and vegetables we puree or squeeze. Not only are they healthy, but they are also delicious, and adults love them as much as their kids do! 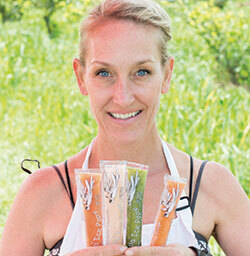 Fairyella Ice Pops contain fresh, organic ingredients and love — nothing else! No added stabilizers, artificial colors, flavors, or preservatives, just fresh, wholesome juice. Only 2 of our flavors contain a touch of agave or organic sugar and each Fairyella Ice Pop contains no more than five grams of sugar! Every child, all over the world, loses a tooth now and again. There are many fairies, even tooth fairies, but with no identity. We wish to give all children, Fairyella the Tooth Fairy, with her companion Dragonfly Floyd and their never-ending adventures. Kimberli Haris, founder and Chief Juice Ninja of Fairyella Ice Pops, was inspired to create these delicious treats when her youngest son was teething, and she wanted something to ease his pain.“I discovered that almost every frozen treat had loads of high fructose corn syrup and artificial flavors and dyes,” she says, “I didn’t want all that stuff, I wanted something healthy and tasty to give my son.” At the time, Kim was already well into her juicing journey. She had been using juice as a way to provide vital nutrients and hydration for her Mom who was undergoing treatment for stage 4 breast cancer. 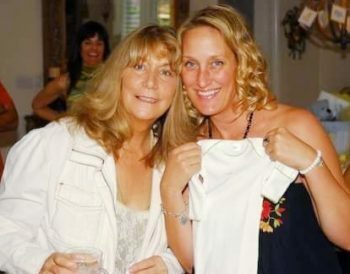 Kimberli named the company “Fairyella” after the tooth fairy that her Mom created when Kim was a little girl. Kim is now working on expanding her business into hospitals and schools nationwide in honor of her Mother. or just have a question? Contact us!